We believe in ensuring the highest standards of quality, reliability and efficiency in all our products. 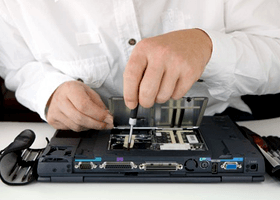 We undertake annual maintenance contract services for all types of computers. → Troubleshooting of hardware related problems. → Parts coverage for hardware. → Provision of standby equipment. → OS Support - Installation / Reconfiguration / Reinstallation of Operating System and other. → Problem diagnosis and rectification on Network Operating System. → Install / Upgrade of software drivers. → Creation of Users, User Login Script, User Home Directory. → Assigning user rights to shared resources (Printers & Directories). → Troubleshooting of Network related Problems. → Management of Networking equipment (Hubs, Switches, Routers, etc.). → Restoration of connectivity of node with the server. → Configuration of Network printers and other Network peripherals. → Maintaining the existing network.